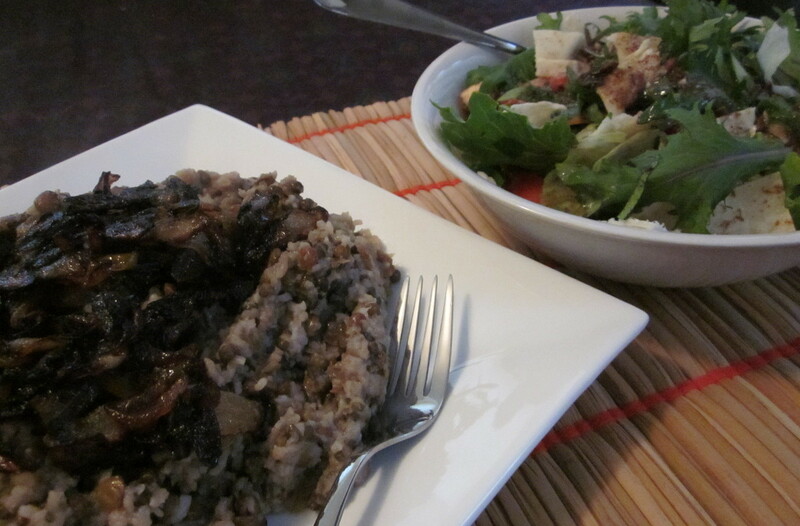 Middle Eastern February – Week 1, Let the Feasting Begin! As sad as we were to say goodbye to Thai January, I have been looking forward to getting into some Middle Eastern cuisine. The flavours are so different, rich and complex. So far we’ve only tried Turkish and Lebanese dishes, but we will be looking at some other countries too. I’d been waiting for this one – super keen to try my hand at making pide! As far as bread making goes, it’s not very complicated, but it is quite messy, as the dough is rather sticky while you’re kneading. It was worth the effort though, I love pide! To go with it I made Turkish Style Roast Vegies. While the vegies are warm you pour over a chilli oil dressing and then toss it all in a yoghurt sauce. Yum! We were off to a good start! In the morning I made a Fattoush Salad, using an array of different vegies. The beauty of this is that you can make it using whatever you have on hand. The dressing is wonderfully rich and tangy, with sumac and pomegranate. Steve made Mujaddara – lentils with rice and caramelised onions. Simple and delicious, the lentils and rice are cooked together then topped with the caramelised onions. It went really well with the Fattoush Salad. 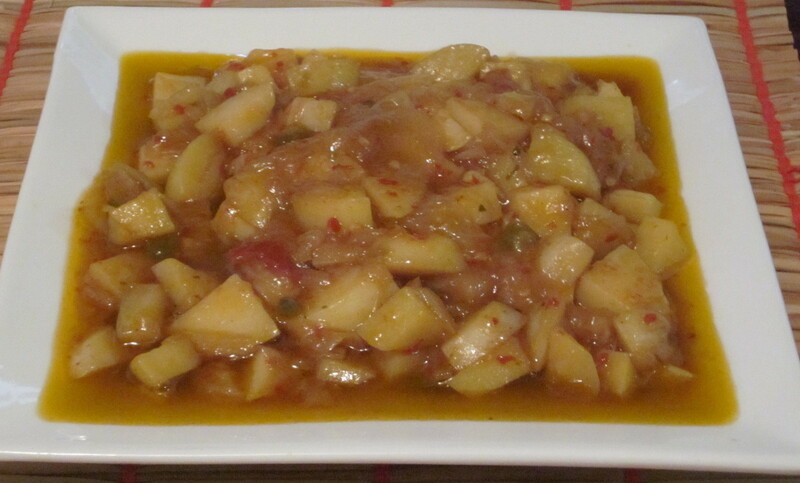 I took leftover salad and Turkish Vegies to work for lunch, and then later on at home while I was busy catching up on a few tasks, Steve made Batata Mle’aayeh – spicy potato sauteed with onions and tomato paste, quite simple but utterly delicious. We had it with Mujadurra and Turkish Roast Vegies. Perhaps not too surprisingly we had built up quite a few leftovers, so we decided it would be wiser to finish some of the things we had rather than keep making more – plus we were running out of room in the fridge. So we had Mujadurra, Batata Mle’aayeh and the last of the Turkish Roast Vegies. 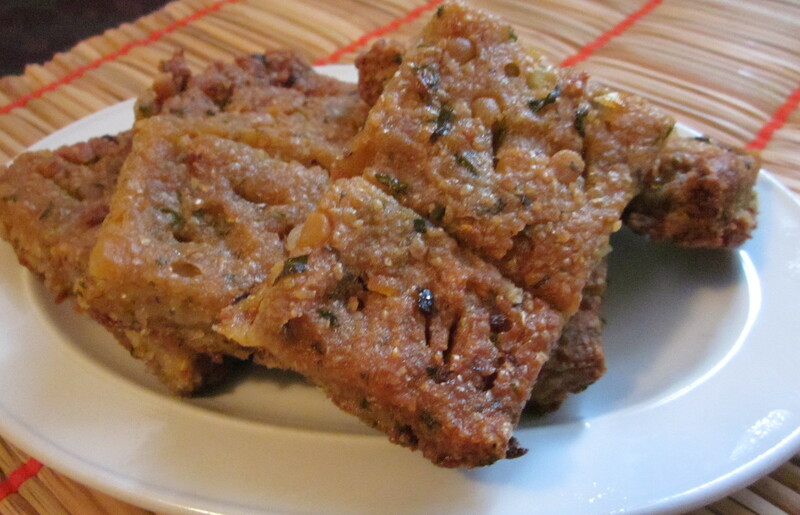 Steve was looking forward to having a go at making Kibbeh Aat’aa – Potato Kibbeh. It takes a while to make, so he started mid-afternoon. Our oven probably wasn’t hot enough, so it got a bit crispier on the outside than it was meant to, since it took longer to cook, but still it was delicious. 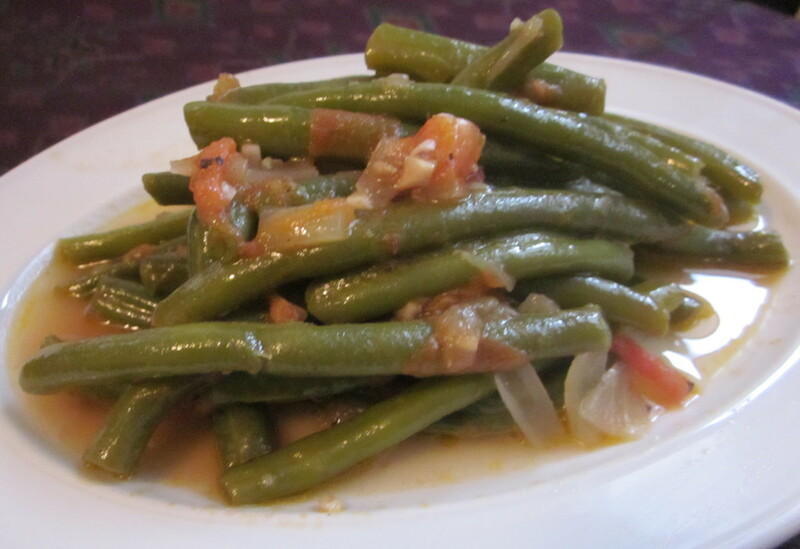 I made Loubieh Bi Zait – Stewed Green Beans in Olive Oil, the list of ingredients may be short, but it was really good! Steve doesn’t usually like green beans that much, but he loved this! 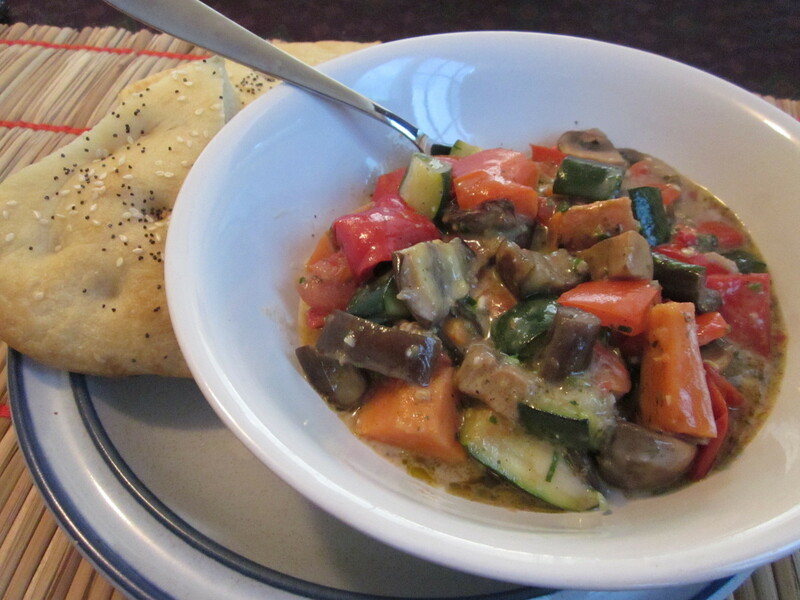 The recipe Steve used to make Kibbeh, made rather a lot, so I made a simple mixed vegetable dish to go with it. 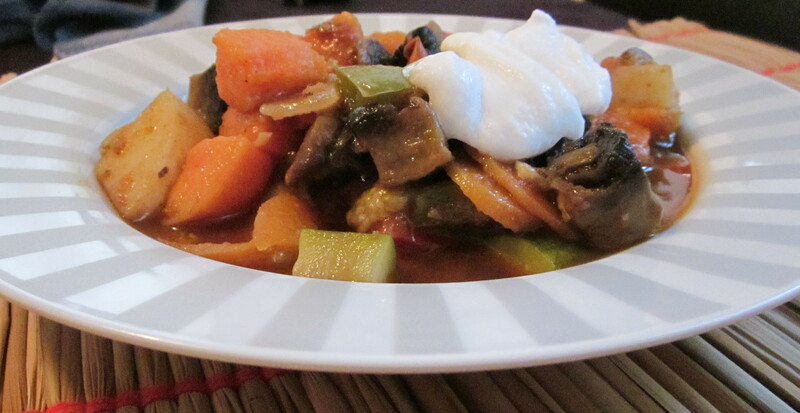 Zeytinyagli Turlu – mixed vegetables in olive oil, a very similar dish to the Loubieh Bi Zait, with simple ingredients, relying on the flavours of the vegetables. Topped with a little coconut yoghurt – delicious! I decided it was time to have a go at a dessert. My choice was dependant on already having the required ingredients. 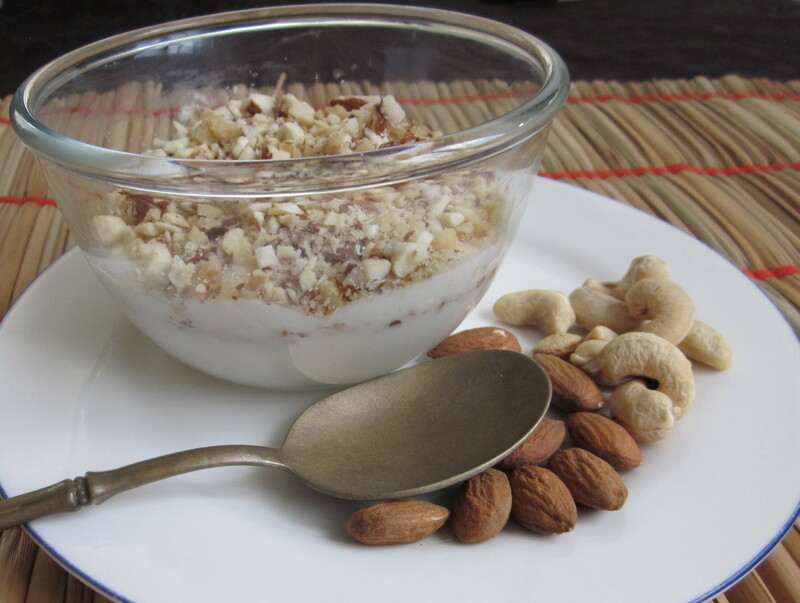 In the end I settled on Kishk el Foukara – milk pudding with nuts. I actually didn’t have all of the necessary ingredients, the most important being orange blossom water, but I did have rose water which seemed like a good substitute. I also had some coconut cream to use up, so used that in place of some of the milk. Mmmmmm it was good, delicate and not too sweet.